Switch on update – day 15! Well the 2 weeks since my switch on have flown by. I’ve been so busy with work and social stuff with friends and family that I haven’t had too much time to really think about my CI progress. 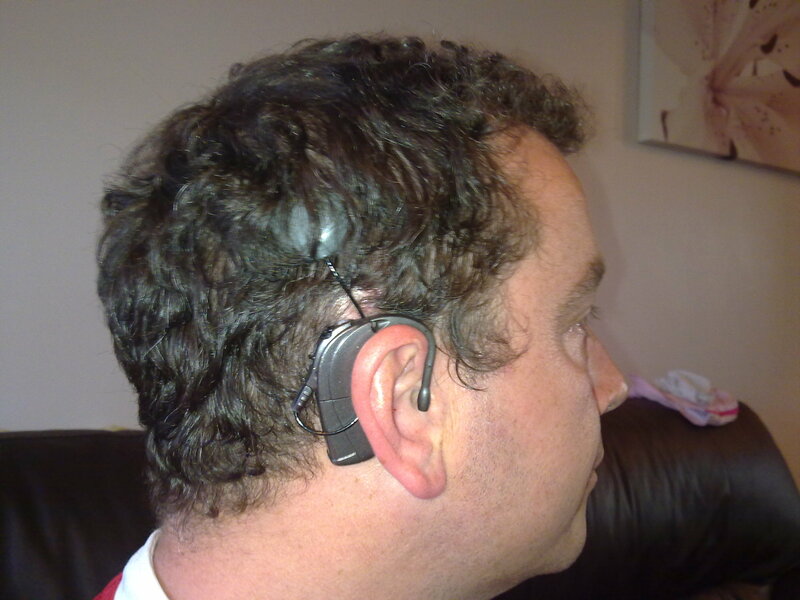 The external unit itself is very comfortable on my ear but I was having a problem with the cable sticking out and getting it caught on clothing as well as offering something tempting for my girls to grab hold of!! I have over come this problem by wrapping the cable around my external unit which shortens the cable perfectly to attach the magnet. No more sticking out cable!! Yay!! I went back for re-tuning and a volume increase after 7 days and boy did I need it. This time my volume was increased a huge amount and my IDR was put up from 60 to 80. (Which apparently after only 7 days is pretty good). I also got them to take off my loop setting and go with normal on setting 1, clearvoice medium and high on settings 2 & 3. The loop setting was pointless as my recognition of speech was still so poor it was a waste of a setting. After my re-tuning I found the next few days a real struggle. Everything was so much louder and distorted that it was not fun. Gradually though after 2 to 4 days the sound has become much more comfortable and dare I say…….NORMAL!! Yay. I still find speech really tough but people are sounding less robotic and more how I remember them. My little girls however are still like little robots……but sounding like very cute little robots………most of the time anyway!! I have been using my CI more and more without my HA since my re-tuning and it has been fine most of the time. Sounds are becoming normal. I find when I have my HA on too I get two different sounds entering my head too. Quite amusing I think at the moment. A text message on my phone comes through in two different tones!! It could be confusing I suppose but I’m riding along with it and enjoying it most of the time. I mentioned sounds are becoming more normal now. Well, I have to say they are generally. I still can’t make out the radio or the TV but other than that I reckon it’s nearly all there. I noticed a squeak on one of our doors the other day and asked my wife when that had started. ‘Months ago’ was the reply. That’s nice……..squeaky doors again!! Yay. Other sounds are the birds chirping, the owl in the evening twit twooing, indicators in the car, aeroplanes and helicopters overhead, branches rustling in the wind, cat meowing and purring………the list goes on!! In fact, when I take the CI off now and just wear the HA the sound I hear is so poor it just shows how good the CI is. I’m still frustrated by speech but I have to keep reminding myself it’s only been 2 weeks!!! A quick mention of my tinnitus. It’s still there 😦 but hardly noticeable when I’m wearing the CI. As soon as I take the CI off it’s there straight away with that lovely washing machine sound!! Ah well, at least it’s gone most of the time. Maybe that will calm down in time too??!! To sum it up………my hearing is loads better, I’m frustrated by speech and social situations, my girls are still robots although other people are sounding more like themselves again, environmental sounds are pretty normal now, music on my MP3 is about 70% now (compared with zero before!) and I’m going back to the hospital in 2 weeks to get re-tuned and tested again. how do you listen to music with the C.I- plug your ipod into the unit or wear ear phones. Can you hear vocals on yer ipod or is it just tunes? questions questions!!! Keep at it, will be interesting to hear when voices start to get more “normal”. Hiya. I plug it straight into the unit at the moment. Will look to get some headphones though in the future. All the voices in the songs sound like Cartmen form South Park is singing them! (Ever watched it??)! I’m happy with just heaing the tunes pretty well for the moment. Interested to follow progress and compare notes. I myself was switched on 7th May, so am about a month ahead of you in time. But my ear had had no hearing for 41 years I so suspect you will soon catch me up. I got meningitis at 3. Use a hearing aid on the other side, but that ear is knackered and what I have left is fading away. 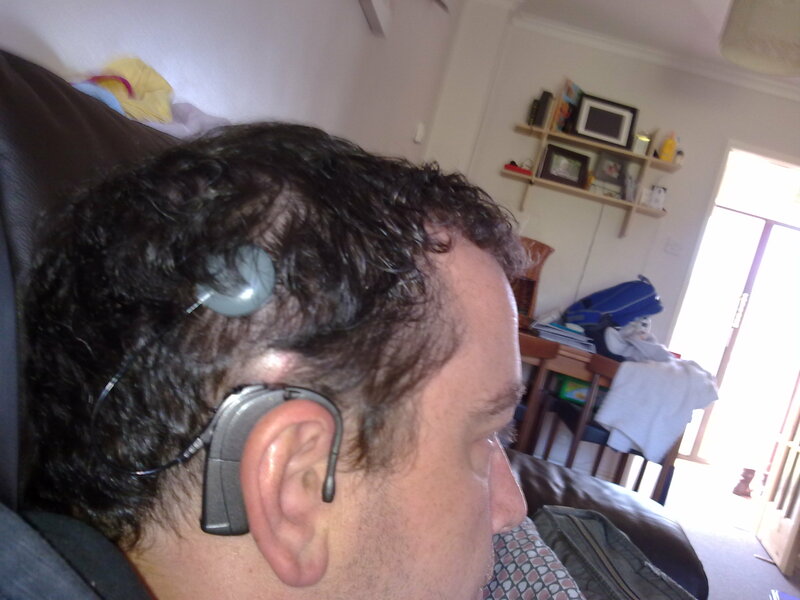 Am a UK citizen, emigrated to Australia in 2007, so naturally have gone for a Cochlear, the new Nucleus 5 with the cool remote control… All the best – oh and I’ve enjoyed reading your blog immensely. Thanks Guy. I nearly went for the Cochlear Nucleus but the remote is something I felt would be lost with my 2 young kids!! 🙂 I’m doing well with the AB though. You say I will soon catch you up. How well are you doing then? Be nice to know what I might be able to achieve in a months time!! Glad you like the blog. I was inspired by an ozzy girl who’s blog I found really useful too. Good luck with the new hearing. How are you doing now Graham? How is it at work? Jackhammers going as they break up concrete opposite us. I don’t have the capacity to ignore it – it’s really intrusive. I know now exactly what folks mean when they say they can’t hear themselves think. We have all been complaining and when I did too, a very sweet girl gave me earplugs to try and help. My entire office collapsed with laughter. Won’t be long until your 1 month appointment!